Re: the challenge: This was hard work. 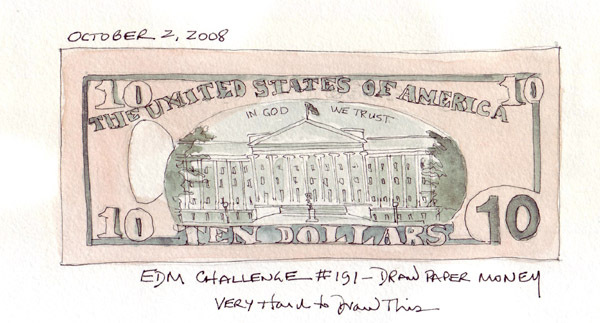 I was going to comment on how well Sandy had drawn both sides of a bill, when I looked at our new member's (Speck) drawing of many paper bills! 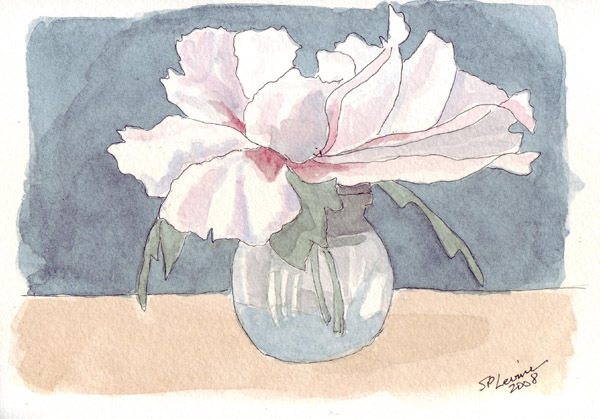 I saw Sherrie and Kathleen's Tree Peonies and just had to try one for my daily sketch today. I didn't know anything about the Virtual Sketch Date, but now have it bookmarked to see what photos are posted in the future. I need lots of practice sketching and painting reflections on glass, so this was a good challenge for me while I was trying to listen to the important news broadcast while painting. This is a painting of my travel watercolor set - made by Daler-Rowney - and purchased on sale at Pearl Paints in New York City. The only other time I saw this set was in a similar drawing in The Creative License - page 57 - by Danny Gregory. 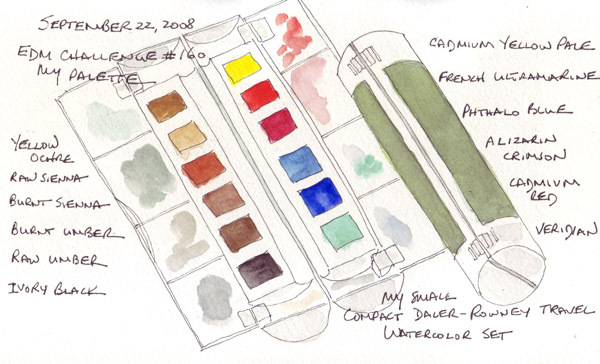 I don't like the color selection as much as my palette of Winsor-Newton paints which I use at home, but I've learned to mix enough colors to make it workable - and it is small, light, and functional. 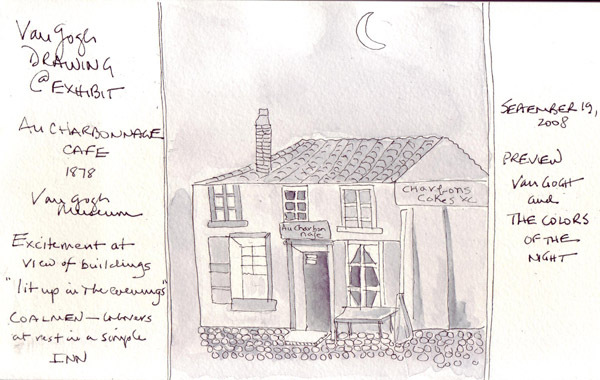 Although my sketchbook is in part a visual journal of my daily life, it is also the place that I practice drawing and painting. 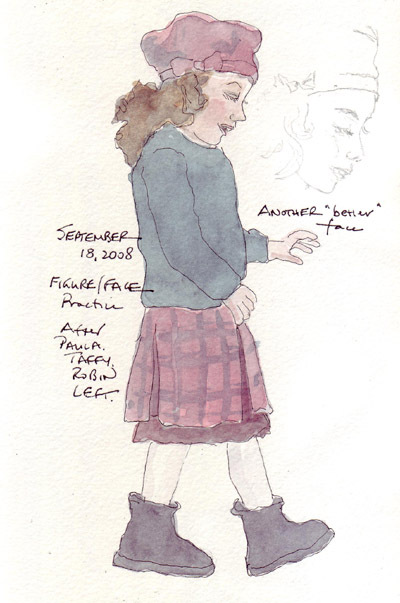 This year, one of my goals was to practice figures and especially faces, and I found that I could instantly make a toddler look like a teenage as soon as I sketched in a face. Yuck! I couldn't stand the page I did Friday so I tried again in pencil the following morning. So this shows my "old" child's face and a slightly more youthful child face in pencil along side. Yesterday I went to the preview of the new Van Gogh exhibit at the Museum of Modern Art (Van Gogh and the Colors of the Night). I like to draw from the Masters, and like to do at least one sketch at art exhibits, Yesterday I chose an 1878 shaded pencil drawing that was in a glass case. It is such an early drawing of Van Gogh's that it isn't even included in the huge VanGogh gallery of drawings on the web. He shaded in pencil, but I used gray watercolor to try to achieve the same tones. In a note included with the drawing, Van Gogh said that he loved buildings lit from within during the evenings when workers were at rest. I also love to walk by homes lit from within during the evening hours - canal houses in Amsterdam and brownstones here in New York City - so this drawing really resonated with me. I finally had to skip the peanut challenge and move on. We don't have peanuts in our house and I haven't seen any around during the last few weeks. But we do have multiple packs of disposable razors - yellow for me and blue for my husband. 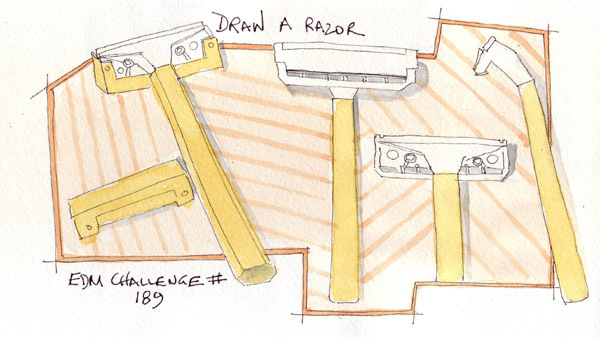 I enjoy doing sketches from multiple angles so this razor was fun for me to draw.